The last hoorah… for now! In this last episode of the current series we head to the Forever Waterfall Safari Lodge next to Loskop Dam, where we tackle a tough 4×4 trail. We also reveal the 33-inch Toyota Fortuner, our Africanised Subaru XV and we get three Joe Soaps to drive the Jeep Wrangler Rubicon project vehicle off-road. We take a trip down memory lane with some highlights of the past three months, including footage of presenters getting 4x4s stuck. And “a special moment” in a gymkhana test, in sand. We also look at some of the presenters’ links that – thankfully – never made it into the programme. This is the one episode in the series you need to PVR, because you really will want to see it a few times. With an engineering background, Graeme is the technical mind of the team. His skills include camerawork, editing & generally looking after the production process. Graeme doesn't do mainstream, thats why he drives a Jeep KJ, wears toe shoes and shoots video on his DSLR. I have a Rubicon and in your last show you have mentioned the stage one conversion (exhaust, chip, air filter, dyno tune) you have done to your 3-door Rubi. Can you provide me with he contact details? I have made contact with SAC in Midrand, but I want to get input from another supplier before spending that kind of money. On 7 March the 4WD Club of SA’s Base 4 track, near Hartbeespoort Dam, was buzzing. The event was the annual Reach for a Dream 4x4 Day. 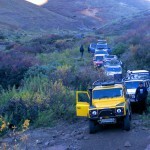 Trip report for the Letele Pass attempt by members of the 4x4community forum. 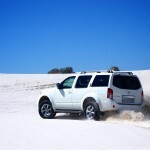 Sand blasting… in a Nissan Pathfinder? Diesel? Yes sirree! During a recent visit to the Mother City we joined the Jeep Club of SA at the Atlantis Dunes for some sand blasting action. Find out how the 140 kW Nissan fared.